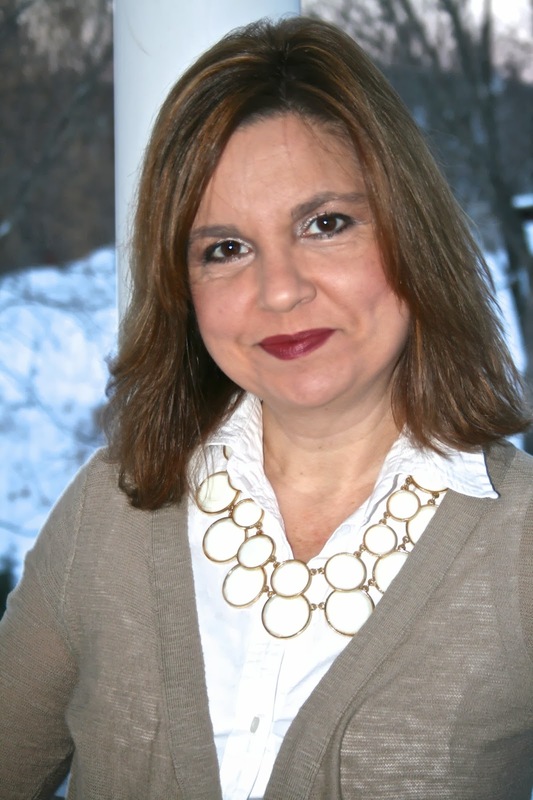 Amy's Creative Pursuits: Fashion Over Fifty: What to wear with Red Pants? I wore a simple sleeveless button down white blouse with a white tank underneath. I topped the white shirt with a camel covered boyfriend cardigan from a.n.a. For jewelry, I wore a white and gold statement necklace from Stitchfix and gold bangles. On my feet I wore leopard flats from Target. I was actually saving these pants for later in the winter when it warmed up a bit, but I have grown so tired of wearing black, brown, or grey everyday that I decided to wear them now. I was really surprised how WARM they were. The ponte roma knit is so thick that it really kept my legs warm. Now I worry my pants might be too warm for Spring. The leopard flats on the other hand, were impractical for this time of year. I only had to make it from my house, to a car, to a parking lot, to a building, but with our Wisconsin weather no matter how hard I tried, my feet got covered in snow. Back to the booties! 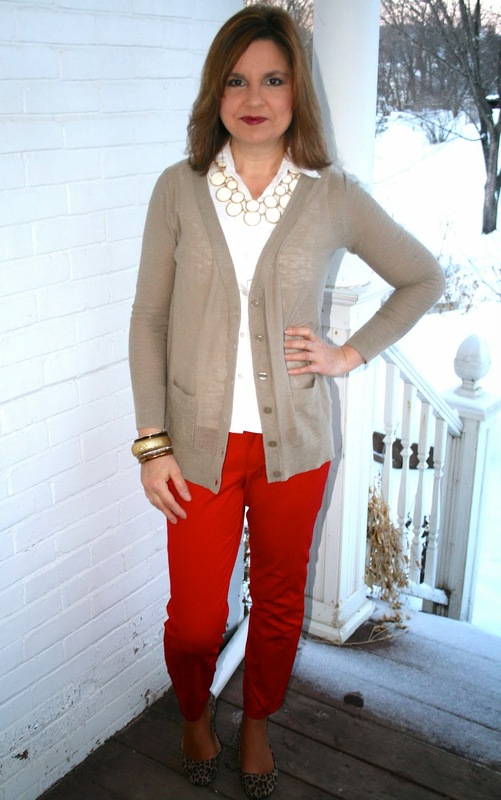 Here are some more fashion inspiration pictures from Pinterest of how other women style red pants. Which one is your favorite? And again very nice Amy! I wear a navy blue striped shirt and a jeans jacket on red. But your combi is super. Fabulous outfit Amy, I love the color red, but it's usually tops (because I really only wear jeans and occasionally khakies or black pants). But I love how reds look with Jeans, so from the outfits you shared, my favorite one is the last one. Love that purse pictured too! Oh wow superb look ! Love your flats, wonderful ! Been years since I wore red pants but if I remember correctly I used navy a lot. My fav combo is the first one. Guess taste changes as time goes by as I am really liking the beige with the red. Black with red is a wonderful, dressy look for holidays or valentines or whenever you just what to make a cheery appearance. Love the camel and white with the red, too.